Homewerx Home Inspection Blog: Can Masonry Homes Get Termites? You are right. I had masonry on my older home and it got termites before pretty badly. I caught it a little bit late. I have seen similar tubes in older homes in Houston and also seen a few homes where you can see mud spots every 24" apart in the ceiling. 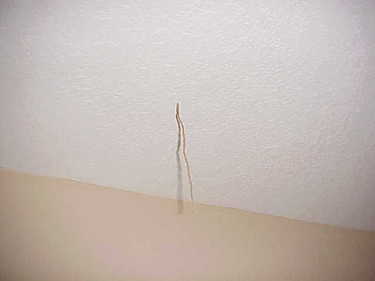 The termites have eaten all the way across the roofs ceiling joints. It does make it easier to determine joist distance apart. Termites are a huge issue. I had a sister who purchased a home in Texas and wasn't even aware of the problem until she tried to sell the home and the inspector notified her. I hate the little buggers. Great pic, never seen a tube inside a masonary home before. Such a great post about home inspector Kennewick WA. Keep on posting!